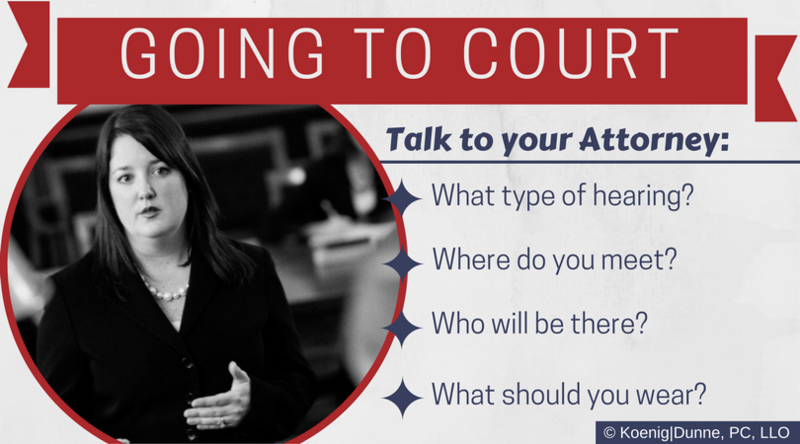 “Going to court” can mean many different things during the divorce process. You may have to go to court for a hearing, a pre-trial conference, or trial. Sometimes it is permissible for your attorney to appear on your behalf without the need for you to go. Sometimes the judge will want to hear you testify. Sometimes the judge will read your sworn statement and listen to the lawyers’ arguments in order to make a decision. The thought of going to court can be anxiety-provoking. The fear of the unknown may set in. It is important to communicate with your attorney so you know what to expect. Your attorney can explain the process in advance. If you do go to court, know that your attorney will be with you at all times to support you. When a court date is set, we will let you know. As soon as you receive notice from your attorney, confirm whether your attendance is required, and mark the date on your calendar. Your attorney will be able to tell you whether the judge will make his or her decision based on affidavits (sworn statements) and arguments by the attorneys, or if the judge will hear live testimony. In some cases, the parties will wait while the attorneys meet with the judge in his or her chambers (office). Each judge runs his or her courtroom differently. Rely on your lawyer’s expertise in preparing for your specific hearing. If you plan to attend the hearing, let your lawyer know and determine where and when the two of you will meet. Make sure you know the location of the courthouse, where to park, and the floor and courtroom number. Decide what you’re going to wear. Business casual attire is usually appropriate. Do not wearing anything distracting, such as flashy jewelry. You want the judge to focus on the issues, not your attire. Planning such simple matters ahead of time will alleviate stress. Sometimes having additional support, such as a friend or family member to accompany you, may be appropriate. Talk with your attorney first to see whether this is advisable. If you are afraid to see your spouse at the courthouse, make your lawyer aware of this fear. There are options to minimize contact with your spouse. Your lawyer knows the layout of the courthouse and will be able to make sure you are comfortable as possible in your surroundings. Divorces will proceed to trial if settlement negotiations fail. Your lawyer will help you fully prepare for this court appearance. There are no juries in family law matters, and usually, the only people who will be present in the courtroom are the judge, court reporter, attorneys, you, and your soon-to-be former spouse. In some cases, there will be many hearings (often on procedural matters that do not require your attendance). In other cases, you will never step foot in the courthouse. It all depends on your unique circumstances. Going to court is not an inevitable part of the divorce process. And if you do have to go to court, lean on your legal team to fully support you.